Azure Event Grid enables you to react to events in IoT Hub by triggering actions in your downstream business applications. This article walks through a sample configuration that uses IoT Hub and Event grid. 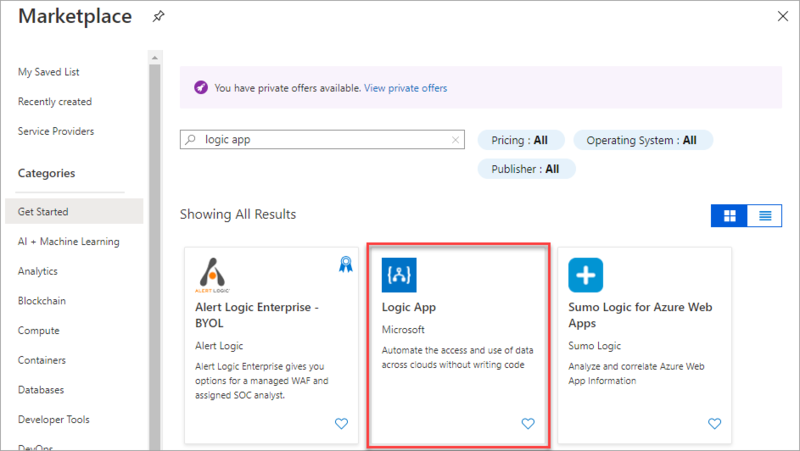 By the end, you will have an Azure logic app set up to send a notification email every time a device is added to your IoT hub. An active Azure account. If you don't have one, you can create a free account. An IoT Hub in Azure. If you haven't created one yet, see Get started with IoT Hub for a walkthrough. First, create a logic app and add an Event grid trigger that monitors the resource group for your virtual machine. 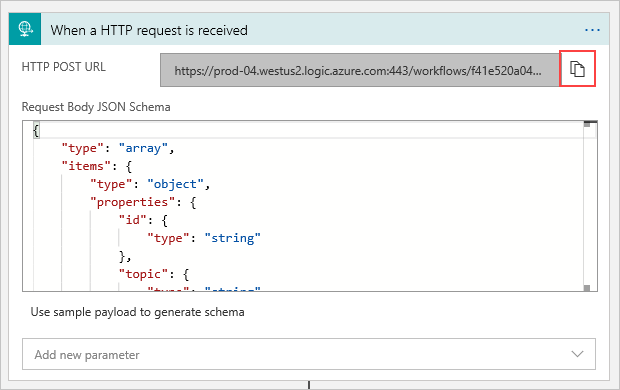 In the Azure portal, select Create a resource > Integration > Logic App. Give your logic app a name that's unique in your subscription, then select the same subscription, resource group, and location as your IoT hub. Once the resource is created, navigate to your logic app. The Logic Apps Designer shows you templates for common patterns so you can get started faster. In the Logic App Designer under Templates, choose Blank Logic App so that you can build your logic app from scratch. A trigger is a specific event that starts your logic app. For this tutorial, the trigger that sets off the workflow is receiving a request over HTTP. In the connectors and triggers search bar, type HTTP. Select Request - When an HTTP request is received as the trigger. Select Use sample payload to generate schema. You may receive a pop-up notification that says, Remember to include a Content-Type header set to application/json in your request. You can safely ignore this suggestion, and move on to the next section. Actions are any steps that occur after the trigger starts the logic app workflow. For this tutorial, the action is to send an email notification from your email provider. Select New step. This will open a window to Choose an action. Based on your email provider, find and select the matching connector. This tutorial uses Office 365 Outlook. The steps for other email providers are similar. Select the Send an email action. If prompted, sign in to your email account. To: Enter the email address to receive the notification emails. For this tutorial, use an email account that you can access for testing. Subject and Body: Write the text for your email. Select JSON properties from the selector tool to include dynamic content based on event data. Before you leave the Logic Apps Designer, copy the URL that your logic apps is listening to for a trigger. You use this URL to configure Event Grid. 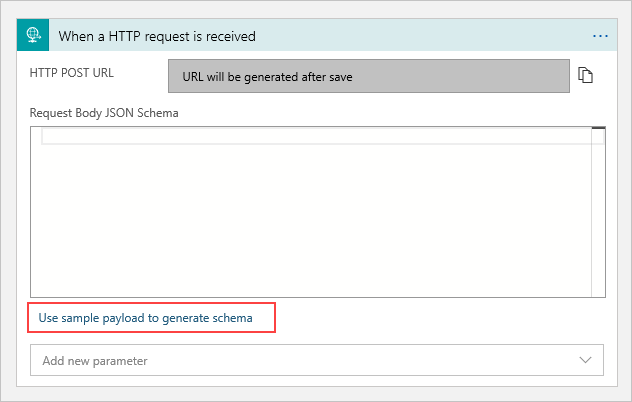 Expand the When a HTTP request is received trigger configuration box by clicking on it. Copy the value of HTTP POST URL by selecting the copy button next to it. Save this URL so that you can refer to it in the next section. 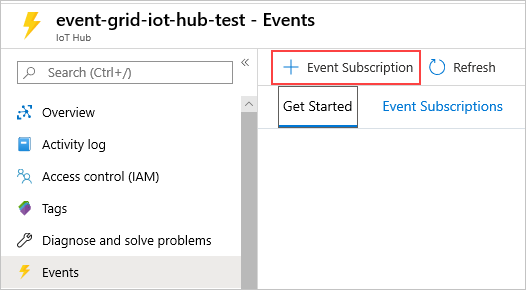 In this section, you configure your IoT Hub to publish events as they occur. In the Azure portal, navigate to your IoT hub. Event Type: Uncheck Subscribe to all event types and select Device Created from the menu. 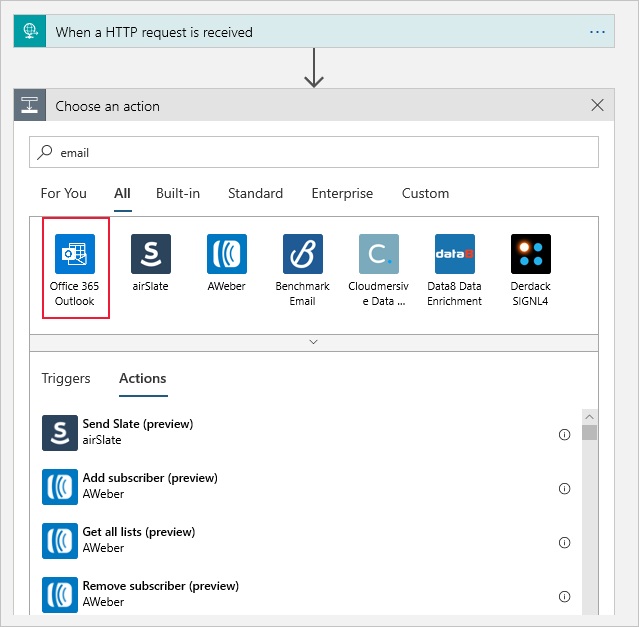 Endpoint Details: Select Endpoint Type as Web Hook and click on select endpoint and paste the URL that you copied from your logic app and confirm selection. You could save the event subscription here, and receive notifications for every device that is created in your IoT hub. For this tutorial, though, let's use the optional fields to filter for specific devices. Select Additional Features at the top of the form. Subject Begins With: Enter devices/Building1_ to filter for device events in building 1. Subject Ends With: Enter _Temperature to filter for device events related to temperature. 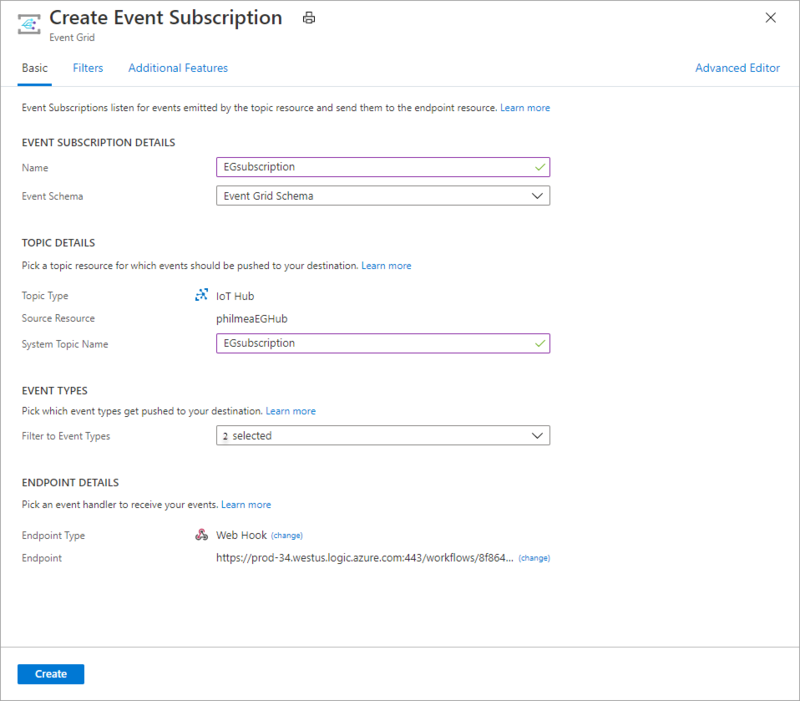 Select Create to save the event subscription. 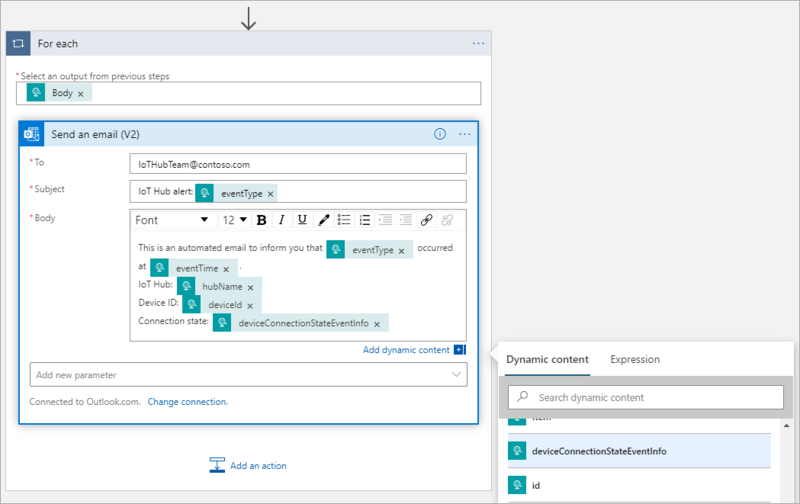 Test your logic app by creating a new device to trigger an event notification email. From your IoT hub, select IoT Devices. For Device ID, enter Building1_Floor1_Room1_Temperature. Once you've added a few devices to your IoT hub, check your email to see which ones triggered the logic app. 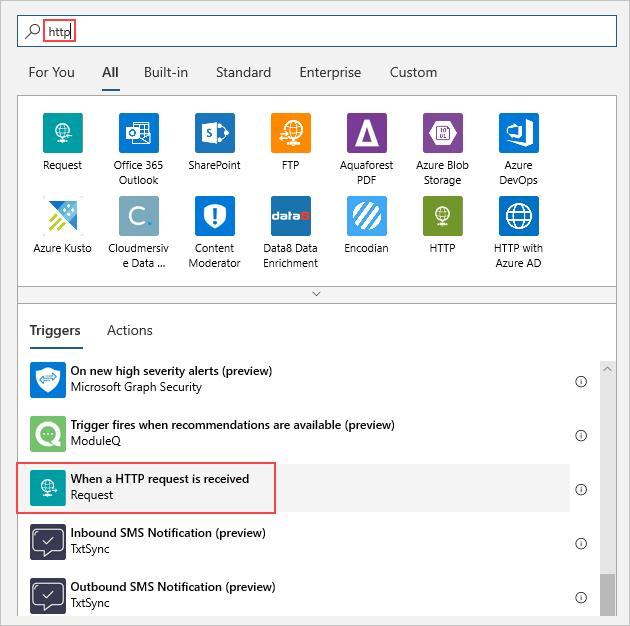 This tutorial used resources that incur charges on your Azure subscription. When you're done trying out the tutorial and testing your results, disable or delete resources that you don't want to keep. If you don't want to lose the work on your logic app, disable it instead of deleting it. Navigate to your logic app. On the Overview blade select Delete or Disable. Each subscription can have one free IoT hub. If you created a free hub for this tutorial, then you don't need to delete it to prevent charges. Navigate to your IoT hub. On the Overview blade select Delete. Even if you keep your IoT hub, you may want to delete the event subscription that you created. In your IoT hub, select Event Grid. Select the event subscription that you want to remove. 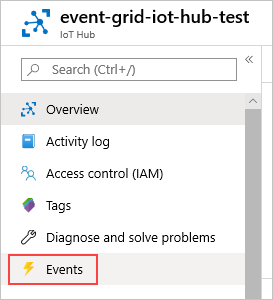 Learn more about Reacting to IoT Hub events by using Event Grid to trigger actions. Learn about what else you can do with Event Grid.